Thai-invested paint manufacturer 4 Oranges has launched an odorless paint in Vietnam, saying it continues to develop green products in the market where it sees increasing demand. The company, which operates a US$14.5 million factory in Long An Province adjacent to Ho Chi Minh City, held a launch for the Spec Odorless Kot indoor use paint in the city Thursday. 4 Oranges marketing director Chalermsak Pimolsri said during the past three years, his company has invested more in research and development of green decorative paints with low volatile organic compounds (VOC) and such features as anti-bacteria, anti-heat, shimmer surface and odor free. The new product, Spec Odorless Kot, meets the green standards of Singapore and Thailand, Spec brand director Nguyen Quoc Quyen said. Test results by the Thailand Institute of Scientific and Technological Research and SGS Testing & Control Services Singapore Pte Ltd show that the VOC in the paint is 10.84 grams per liter. An advantage of the odorless paint is to save time as a newly painted room can be used immediately, Mr. Quyen said, adding that the product is available with up to 888 colors. A five-liter can of Spec Odorless Kot is retailed at VND500,000 – slightly more than US$25. The name of 4 Oranges represents the company’s four brands: Mykolor, Spec, Boss and Expo. Mr. Pimolsri said his company currently holds a market share of 36% in Vietnam. He said the company targets total sales of VND1.5 trillion this year, 10% higher than last year’s performance, but expects a better result. Construction keeps expanding in Vietnam, with demand of steel and cement increasing, thus more paints will be used, he elaborated. “We will manufacture new products to replace current ones,” he said, adding that 4 Oranges annually launches one or two environmentally friendly paints. During a meeting with reporters in January this year, 4 Oranges chairman Smit Chea said the current annual use of paint per person in Vietnam is about 1.5 liters, while that in Thailand is four liters, and seven liters in developed countries. 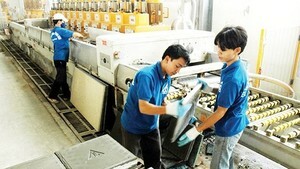 This means demand in Vietnam is still low and could keep increasing.